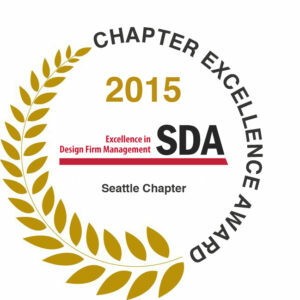 The Seattle Chapter of the Society for Design Administration (SDA) won the National Chapter Excellence Award (CEA) for 2014. Berger’s Stacy Rowland served as Chapter President through May 2014, and Judy Beebe of Parsons Brinckerhoff served as President for the remainder of that year while Stacy became Vice President/Past President. 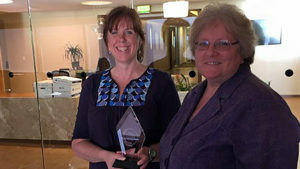 Stacy and Judy received the award on behalf of the chapter. The Chapter Excellence Award was developed to recognize a chapter’s excellence in promoting SDA’s Mission, to “advance management and administrative professionals in the A/E/C industry through education, networking, and resources.” The CEA is a comprehensive recognition program based on exceptional merit demonstrated in six categories: best practices, leadership/professional development, membership, communication, education, and chapter governance. The point-based system serves as a resource to help submitting SDA chapters identify their strengths and inspire future growth. The CEA becomes a platform for facilitating the innovation of new and creative ideas and concepts, thereby enhancing and improving activities among other chapters and SDA members. “If what they have accomplished to date is any indication, SDA Seattle will meet and no doubt exceed their goals for 2019,” wrote the jury. 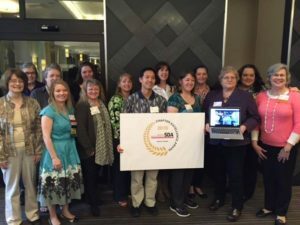 Congratulations to everyone in the Seattle Chapter on a job well done!